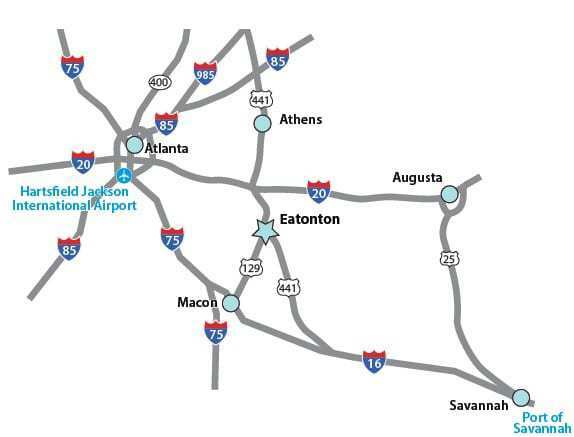 Centrally located in Georgia and the Southeast, Eatonton and Putnam County offers extensive access to rail, road and air supply lines. Because of our first-rate transportation infrastructure and excellent connectivity, we can offer supply chain management solutions that give your company the competitive edge you are looking for while improving your bottom line. Situated in the center of Georgia between Atlanta, Augusta, Athens, and Macon, Putnam County is located 10 minutes south of Interstate 20, 78 miles southeast of Atlanta’s Hartsfield-Jackson International Airport (the busiest airport in the world) and 185 miles northwest of the Port of Savannah (the 4th largest sea port in the United States). The City of Eatonton provides natural gas service to Eatonton and Putnam County. Georgia Power and Tri-County Electric Membership Corporation provide electric service to Eatonton and Putnam County. The Eatonton-Putnam Water and Sewer Authority (EPWSA) and Piedmont Water Company provide water and wastewater service to Eatonton and Putnam County. Norfolk Southern Railroad provides rail service to Eatonton and Putnam County.